Left : Ball-and-stick model of the a penta-tert-butyl corannulene molecule and the calculated ESQC-STM image of the molecule adsorbed on Cu(111) surface. 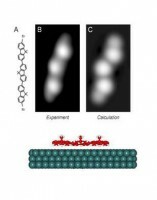 The molecular conformation on the surface was determined with the ASED+. Right : Identification of a dibromoterfluorene monomer conformation on Au(111). Part of the theory/simulation GNS activity is related to the adsorption of large molecules on perfect and hybrid (metal-insulator and metal-semiconductor) crystal surfaces such as their energetics on the surface including diffusion, stable adsorption sites, electronic and vibrational structures. Basically, two complementary skills are developed. Theory of adsorption of large molecules on surfaces. Since the targeted molecules are quite large, mainly different molecular mechanics (MM) methods will be tested. The development of hybrid (embedding) electronic structure methods is undertaken, combining high quality quantum mechanical calculation of a finite part of the system (the cluster) with molecular mechanics calculations for the rest of the surface system. An embedding method based on a semi-empirical electronic structure technique and using the atom superposition and electron delocalization (ASED) scheme has been developed. At the initial code, supplementary terms have been added in order to take into account the three-body interactions and the long-range interactions such as van der Waals and hydrogen bonding. This new code (called ASED+) can be seen as compromise between standard MM codes and DFT methods : ASED+ is faster than DFT and only few parameters (Slater exponents and ionization potentials) are necessary. As a benchmark, the case of a benzene molecule chemisorbed on Cu(110) has been studied and very good agreements have been found with experimental and DFT results. With this efficient and reliable code, one can study the molecules stability and the molecular surface diffusion at various temperatures. These calculations are not trivial since translational and rotational degrees of freedom of any molecules during their diffusion are combined and will often be accompanied by bond breaking and bond forming events. Constant current STM image in the valence band region of the Si(100)H surface. (1) A full hydrogenated Si(100)H surface. (2) One Si dangling bond. (3) An Si dangling bond dimer on the same Si surface dimer. 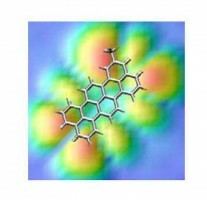 STM and AFM image calculations and molecular manipulations. Once the adsorption site and molecular conformation of the adsorbate are found, theoretical interpretation of experimentally acquired STM and NC-AFM images of adsorbed molecules has to be tackled. For ten years, the EHMO-ESQC method (extended Hückel molecular orbital – elastic scattering quantum chemistry) has demonstrated its efficiency to interpret experimental STM images with a very good degree of confidence. At least, some fifty papers have already been published where ESQC was used with various adsorbates (atoms, small and large molecules) on metallic, on semiconducting substrates, and on thin insulating films as well. Actually, there are different ways to simulate a STM image, ranging from the simple Tersoff-Hamann model (especially for bare surface) to non-equilibrium Green’s functions density functional theory for modeling the electrical properties of molecular systems. According to the size of the simulated systems that most people are dealing with (typically several hundreds of atoms), the ESQC method seems to be reliable with a reasonable computer time consuming. Efforts have been done to improve the ESQC code to speed up more the computation time. By reducing the image computation time, it may become possible to perform the optimisation between experimental and numerical results leaving the computer to follow the convergence automatically. A parallel version of ESQC was also developed and is the main tool for simulated image production right now. NC-AFM is not only able to obtain accurate images of various substrates, but also to get energy dissipation information within the surface/adsorbates/tip system. The identification of molecular soft phonons related to the dissipation channels of a molecule could be used to induce mechanical functions With the help of a numerical NC-AFM, imaging and dissipation signals can be calculated once a specific force-field mesh is introduced as a data set. The improvement of our numerical code was focused on the introduction of different noise sources, similarly to the experimental setup. STM or NC-AFM manipulations of single adsorbates is also an important topic for us. A virtual STM already exists allowing the direct comparison between experimental manipulation signatures and theoretical ones. The precise mechanical behaviour can then be identified. The use of this numerical code will be applied for the manipulation of large molecules. Self-assembly of fivefold-symmetric molecules on a threefold-symmetric surface, O. Guillermet, E. Niemi, S. Nagarajan, X. Bouju, D. Martrou, A. Gourdon, and S. Gauthier, Angew. Chem. Int. Ed. 48, 1970 (2009). The chemisorption of poly-aromatic molecules on Si(100)H dangling bond F. Ample and C. Joachim, Surf. Sci. 602, 1563 (2008). Imaging molecular orbitals by scanning tunnelling microscopy on a passivated semiconductor A. Bellec, F. Ample, D. Riedel, G. Dujardin and C. Joachim Nano Lett. 9, 144 (2009). STM manipulation of molecular moulds on metal surfaces Miao Yu, Wei Xu, Youness Benjalal, Regis Barattin, Erik Laegsgaard, Ivan Stensgaard, Mohamed Hliwa, Xavier Bouju, André Gourdon, Christian Joachim, Trolle R. Linderoth, and Flemming Besenbacher. Nano Res. 2, 254 (2009). Conductance of a single conjugated polymer as a continuous function of its length L. Lafferentz, F. Ample, H. Yu, S. Hecht, C. Joachim, and L. Grill. Science 323, 1193 (2009). Adsorption and switching properties of azobenzene derivatives on different noble metal surfaces : Au(111), Cu(111), and Au(100) M. Alemani, S. Selvanathan, F. Ample, M. V. Peters, K.-H. Rieder, F. Moresco, C. Joachim, S. Hecht, and L. Grill. J. Phys. Chem. C 112, 10509 (2008). A local view on hyperconjugation C. Villagomez, T. Zambelli, S. Gauthier, A. Gourdon, C. Barthes, S. Stojkovic and C. Joachim Chem. Phys. Lett. 450, 107 (2007).